Getting ready for the Fish & Chip run in February. Decided to wash Wooly. Drove it out of the garage at about 11am. It was a rather warm day, hit 100+ F. Well when I got out of the car there was a trail of petrol from the garage, and a look under the car showed a puddle, of petrol. Lifted the bonnet and all was wet. I wasn't too sure where exactly the fuel was coming from, so turned on the ignition and looked. Bubbling out of the carby. Swear curse. 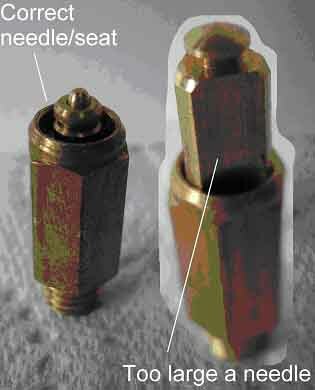 Removed the float cover (I've fitted an HS2) to check/replace the needle valve, which is only a couple of months old. I got my SU bits box and found I had a brand new, still in its sealed plastic bag, needle valve set. Removed the old one, fitted the seat and tried to insert the needle, IT DIDN"T FIT, too big in diameter. Another swear curse. Used a second hand one and refitted the cover, all seemed OK, no leaks. Because the overflow sprayed all over the engine bay, right next to the exhaust, I decided to fit an overflow tube, to guide any future overflow away from this area. I was going to drive the Wooly to the local tubing and other rubber bits store. I barely made it around the corner. The car started stalling, then fired up again and so on. I limped home and started to try and sort this out. After some time fiddling with fuel filters, resetting the fuel mix (it was OK) I gave up just in time for a shower and then had to ingnomiously drive the Hyundai on the run. One good thing was that the Hyundai has air con. 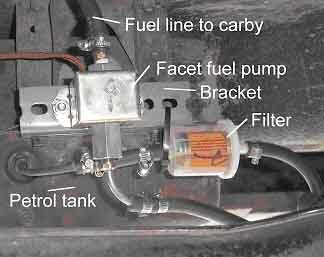 The SU fuel pump had been replaced with a Facet one, which is neither here nor there. Just before totally giving up I checked the fuel pump and its connections and found that the fuel line from the tank was stinking hot, hence I wondered if the stalling could have been caused by a vapour lock, between the tank and fuel pump. It's a bit hard , with a Facet, to tell if it is pumping or not, as they run continuously. Though, at the times Wooly stalled, the pump tended to rattle rather than just knock, then quietened down a bit, car would then start and run for a while. I drove Wooly early next morning, it was a bit cooler, to see if the problem still existed. I seriously considered moving the pump, from inside the boot, to a point much lower down, so the fuel will flow, by gravity, to the pump, and not be sucked up, giving negative pressure and possibly causing a vapour lock. As part of the trouble shooting, I checked the float height, with choke fully out, pump running, the fuel level is just below the end of the jet. I also checked that the inside of the float was dry, and that it moved freely. I went for a drive early on the Sunday, and everything appeared OK, but just as I approached my driveway it stalled out. Luckily I could get enough oomph out of it to drive off the road. 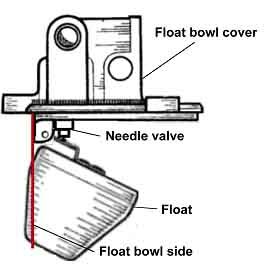 Checked fuel, by removing the float cover, showed that there was no fuel in the bowl. Of course it could be a faulty pump. I spent that Sunday relocating the pump. Prior to doing anything I needed to drain a full tank of fuel. I Mickey Moused a system whereby the pump ran the fuel into various containers, using clear plastic tubing (petrol resistant). What I noticed, after a while of running, was that there were air bubbles in the fuel. Not good, as this indicates a leak on the suction side of the pump. Anyway I figured that relocating the pump next to the tank would allow me to redo the hoses and tubing, from the tank to the pump. After I had finished the work I ran the clear plastic tube from the carby to the filler and let the pump run. This is through 2 filters, one between the tank and pump and the other before the carby. After about half an hour there still weren't any bubbles visible, fingers crossed. One mistake I made, that I eventually corrected, is that I bolted the pump directly to a solid bracket.The car acted as a sounding board. I fitted rubbers to dampen the noise and then went for a test drive. I ran the pump for a considerable time, pumping from the carby hose to the tank, via a plastic tube, with absolutely no problems. No bubbles continuous flow. 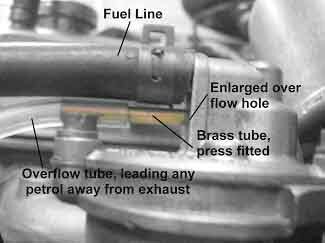 Whilst the pump was in "test" mode I modified the float bowl cover, by opening up the overflow hole, press fitted a brass tube and ran a tube from it through a hole in the skirt, so that any future overflows spill outside the engine bay. Prior to reassembling the cover I checked the float height, OK.
Fitted the cover to the bowl, connected the hose, after stopping the pump and draining the plastic tube. Fired it up and it ran for a few seconds, then died. So after a couple more attempts to start it I gave up and removed the float bowl cover, empty. WHAT THE...? I'm convinced that it is not a fuel feed problem, after all the pump had been running faultlessly for a couple of hours. What could cause it? So, not the pump, can't be a clogged fuel line, as fuel had been circulating quite happily. It must be something with the needle valve. Took it all apart and double checked. Needle moved easily, float is free. Whilst looking at it I wondered if the float was bottoming out in the bowl, NOPE. After a lot more messing around, refitting, removing I had a thought "What if the float is hitting the side of the bowl, when fitted?" (when I initially replaced the needle and seat, I had to fit an extra washer, under the seat, to get the correct float height). Eyeballed it, and yes it could be, see drawing, the red line indicates the side of the bowl. The metal hinge looked a bit bent out of shape, so I spent some considerable time reshaping the hinge, until the float was positioned a bit further in. Everything seemed OK now, float height correct, when open the float had clearance to the side. Refitted, checked fuel level at the jet, and tried starting. IT WORKED! I then gingerly drove it around the block, as I didn't want to nurse it back home from a great distance. No Probs. Got a bit bolder and went for a longer cruise, still no probs. So, what happened? I surmise that, for what ever reason, the original needle valve stuck open and caused the original flooding. The replacement unit had the float sit a bit lower and hit the side of the bowl causing fuel starvation. There was a non problematic issue with the pump sucking air (bubbles in the line) which is now fixed. The pump and its filter are now more accessible, than buried behind the panel in the boot (I have a hoist), the plumbing is much neater and the lines are shorter and direct.